What Is Oatmeal Baby Cereal? Oatmeal may be consumed by a child at about six months of age. Oatmeal baby cereal is often one of the first few foods given to a child, typically after the child has become accustomed to the gentler rice cereal. It is generally formed out of rolled oats that have been processed so that the cereal has a fine texture and is easy for a baby to digest. There are many different types of oatmeal baby cereal available to consumers, such as organic, single grain, multi-grain, enriched, and fruit flavored. In most cases, people are advised to switch cereals slowly, ensuring that the baby is not allergic to the new cereal option. Typically, a child can begin to eat oatmeal baby cereal by about six months of age. Since the cereal has a slightly thick consistency, it is usually transitioned into after the child has been eating rice baby cereal for several months. Once the transition is made, the child may start with single grain oatmeal baby cereal, particularly since it is easier for young children to digest. Some people report that it causes their child to have mild diarrhea, especially when they are first transitioning away from rice cereal. When the child is a few months older, it may be appropriate to give her another form of oatmeal baby cereal. 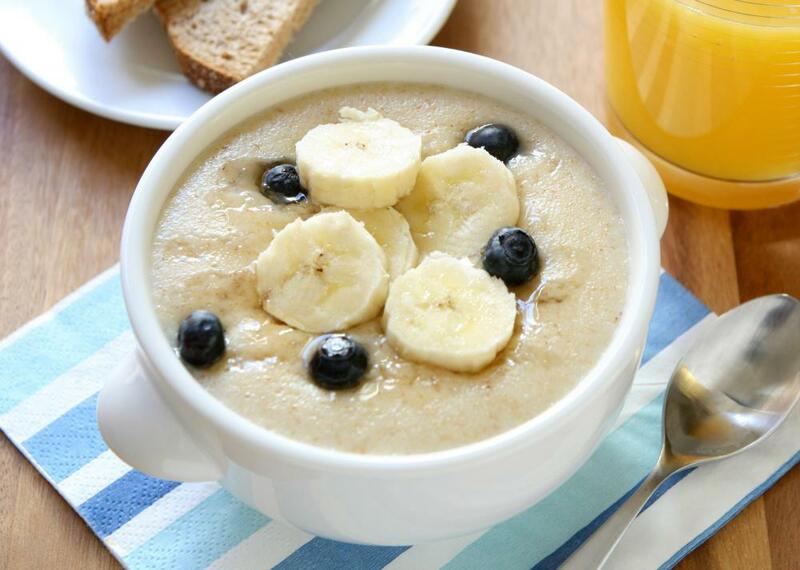 Generally, many people opt for whole grain oatmeal or oatmeal that is flavored with fruit or vegetables, such as bananas, apples, or sweet potatoes. These types of oatmeal baby cereal may taste better to the child, although, in many cases, they provide little additional vitamins or minerals. While oatmeal baby cereal may be made at home, many people prefer to use commercial baby cereal. These cereals may be enriched with minerals, vitamins, iron, probiotics, or the omega-3 fatty acid, docosahexaenoic acid (DHA). Although many still babies receive their nutrition primarily from formula or breast milk at the age of six months, these fortified cereals are believed to work to provide extra nutrients, aid in digestion, and enhance brain function. In some cases, oatmeal is made using organic oats. These oats are grown free from pesticides, insecticides, fungicides, and fertilizers. Some people believe that consuming organic produce will lower the likelihood of becoming affected with diseases later in life, such as certain cancers or even behavioral disorders, such as attention deficit disorder. Generally, oatmeal baby cereal comes in a box and is dry. Formula, breast milk, or water may be added to the cereal in small increments, until it becomes a consistency that the child can safely consume. It may also be purchased in small serving size containers, ready to eat. There are countless recipes for making the baby cereal at home, using adult oats that have been finely processed too. What Are the Different Types of Baby Food Packaging? What Is Rice Baby Cereal? What Are the Different Types of Baby Food Products? What Is Barley Baby Cereal? What Is Organic Baby Cereal? What are Some Different Types of Baby Cereal? What are the Different Types of Baby Food?